Introducing Arlene Ramsey Rogers. Originally from Alabama, this powerful contralto singer has a voice that has stood the test of time. 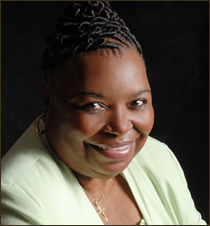 Although Arlene was raised in a Southern Baptist Church by her mother and father, Pastor Chester and Mrs. Mary Lee Ramsey, she moved to New York away from their watchful eyes. This is where she began singing R & B for approximately 15 years before an experience with the Lord opened her eyes to see His Goodness and watch care over her. This encounter with the Lord is the turning point when she went back to her roots of Gospel singing. You see, as a young girl, she along with her sisters formed a gospel singing group called the Ramsey singers. They sang in and around her hometown of Foley Alabama for years before she decided to move Eastward. Arlene has sung with and recorded with groups, choirs and even formed her own group (The Vesper Chimesbut her best performance is as a soloist. When she is out front singing, whether there are background singers or just an accompaniment tape, God has Blessed Arlene with the ability to present a song so that you will receive a Blessing and also believe that she is singing just to you. Her lastest project, "Introducing Arlene Ramsey Rogers...Finally", has a collection of her favorite songs. These are songs that she has been singing for years and the most requested whenever she is performing on different programs. We hope that you will be blessed by this recording and in so doing, invite her to your Church, gospel concert, anniversary, wedding, family reunion or any event that you want a spirit-filled gospel singer. This is a group of talented young men from the state of Georgia. Most of the members are relatives and have been playing and singing gospel music together for over 20 years. The group is managed by Walter Beasley and can be reached at +1-678-698-2568 The group performs at outdoor venues, all Church functions, weddings, family reunions and any other activity where a spirited quartet group is welcomed. 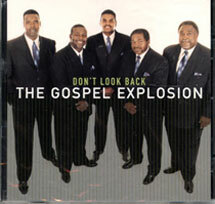 I worked with the group for a few years and produced a very good CD entitled "Don't Look Back", which is still available through one of my distributors www.RTG Records.com or 601-739-3222 aka Deacon Watts.com. 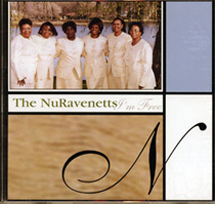 The NuRavenetts is a female group founded by the Rev. Callie Mingo, who is a very powerful Preacher and Asst. Pastor at the Freewill Baptist Church in Freeport, NY. Although the group has not been active in the last couple of years, the CD that was recorded during the time that BMP Records worked with them is still a Blessing to those that hear it. The CD is entitled "I am Free" and it has some powerful testimonial songs that is finding a new audience. This CD can be made available from www.RTG Records.com or from the Rev. Callie Mingo. Please email us at bmprecords@verizon.net for more information.